The second month of pregnancy includes weeks 5-8. This is the time when many women experience the first signs of pregnancy while your baby will start rapidly developing. You might have your first OB appointment during this time. for Mom: You may start feeling the first symptoms of pregnancy, including nausea, fatigue, frequent urination and more. Now is a good time to choose a doctor or midwife to see for your pregnancy and schedule your first appointment. Make sure you're taking your prenatal vitamins every day as they are essential at this point in your pregnancy. for Baby: Your baby's heart, brain, spinal cord, bones and muscles are beginning to form. The umbilical cord forms which connects your baby to your blood supply. Your baby is an embryo dividing into three layers of cells. The top layer will become the central nervous system. The middle layer will become the circulatory system. And finally, the third layer is where the intestines, lungs, thyroid and other internal organs will develop. At this point baby is only approximately .13 inches long. for Mom: You may experience some weight gain due to pregnancy bloating or you might even lose weight if you are dealing with morning sickness. Check out our article How to Beat Morning Sickness for helpful tips on dealing with the nausea. Your breasts may be tender or swell, which is perfectly normal. for Baby: Your baby is busy rapidly growing and will almost triple its size this week! Its eyes and ears are becoming more developed and your baby has a tiny heart that has started to pump blood. 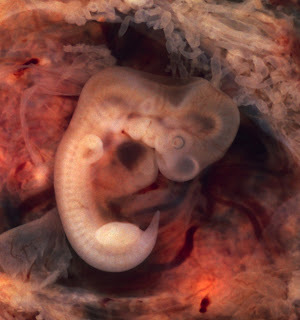 Your baby will grow to be approximately 1/4 inch long and look somewhat like a tadpole. 40 blocks of tissue are forming which will eventually develop into the backbone, ribs and muscles. for Mom: You will likely continue to experience the early signs of pregnancy throughout the first trimester. for Baby: This is an important week as your baby's brain is beginning to become more complex. It is developing cavities and passages which will circulate spinal fluid. The face is becoming more defined, the lenses of the eyes are forming and the middle part of the ear is forming as well. Your baby has tiny buds which will become the arms and legs. Baby is approximately 1/2 inch long at this point. for Mom: Your body is now pumping approximately 50% more blood for your little one. Your uterus has expanded to the size of a grapefruit which could cause cramping or contraction-like pain. If you notice any bleeding, contact your doctor immediately. for Baby: Your baby's ears and eyelids are now developing. Fingers and toes are forming on the arm and leg buds which now have wrists and elbows that can flex. Your baby may now be moving around in your uterus. At this stage your baby's heart beats approximately 150 times per minute. Baby is about .63 inches long.